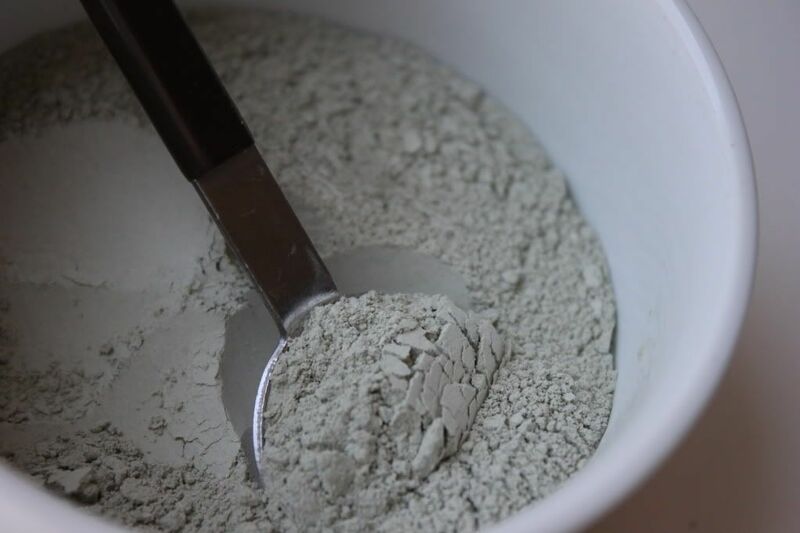 Delighted Momma: Skin Care Tip of the Week *DIY green clay mask"
Skin Care Tip of the Week *DIY green clay mask"
If your skin is looking more oily and congested than normal it's time for a green clay detox mask! Green clay is is an all natural organic material made up of essential minerals and decomposed kelp and seaweed. It works by absorbing impurities and toxins from your skin as it hardens. It also promotes blood flow and leaves your skin feeling like just had the most amazing facial! You may be thinking, "That's great... but since you are an esthetican you can get this stuff easily." Let me share a little secret with you...I get mine in bulk at the local natural market! So you can get it too! 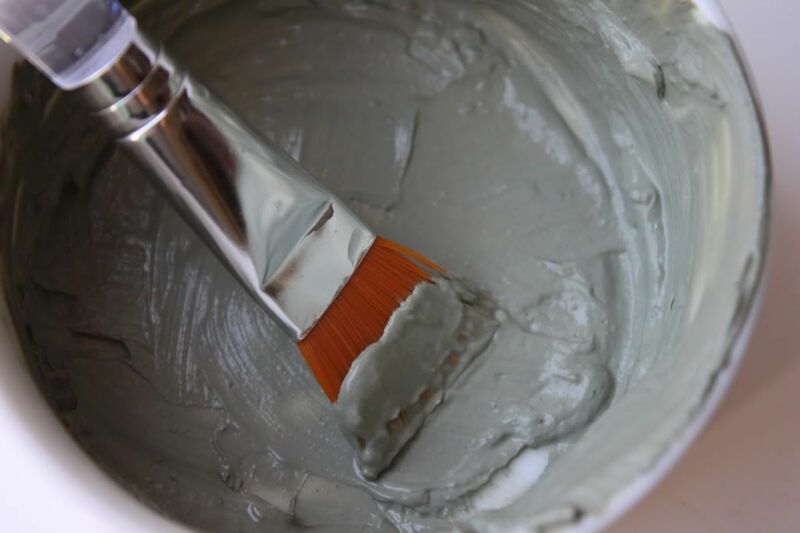 Mix 1 tablespoon of green clay with a few drop of water to make a paste. Apply to your skin with a smooth brush. Let it harden on your skin for about 15-20 min. Rinse with warm water. If you have oily skin I recommend using this at least three times per week. You can also use this mask as a spot treatment if you only breakout on occasion. This sounds AMAZING! I LOVE home remedies! Love this. And I love your blog. Thanks so much for stopping by mine so I could meet you! Oh my goodness! Another one I am trying! Yay for beauty. I am really loving this series! I didn't know you could get this stuff at the health food stores. This looks wonderful! We have a couple of stores like that around here so I will have to check it out! Oh I have a Sprouts near my house! So happy to know this tip!! I LOVE masks too - there's something really relaxing and refreshing about them! Thanks so much Lindsay - you give the best advice! You're so great! Love this! Haha! I was thinking, 'Where would I get this stuff?' and then you answered it. Thanks for the tip! Love this! When I get back from my vacation, I am SO doing this. :) Thanks for sharing! oh i'll have to go look for this. thank you so much for sharing it! Thanks for that Lindsay. I'll check out my local store. I could so do with a mask at the moment. My skin is very dry from the cold weather and warm air conditioning every where you go. It really needs a good treatment. Very great post. If you like my blog, you follow me. I'll follow you too :D.
love this!! totally gotta be trying this out! Great tip! I use a similar ready made clinique mask, but I'm sure this way is just as effective and 10x cheaper! This sounds wonderful. My face needs all the help it can get. I have been breaking out like crazy! My sister love masks like these! We tease her because when the mask is on, she looks like a swamp creature ;) Sounds like I should give it a try, too! I definitely need to try this mask out, thanks for the info! I'm glad you enjoyed my cake, I just made a Pintrest account the other day but I need to figure out how to use it! I have very sensitive skin. Do you think my face will be able to handle this green clay mask? thanks so much for the tip! this looks awesome! I'm blog hopping and found yours! I REALLY should make the mask and use it!!! I'm following and would love for you to check out my blog and follow back! Thanks so much for sharing! Can't wait to try this out. Thanks for reminding me to deep clean my skin. I've been getting soooo lazy lately with this. Do you think it's not enough to exfoliate? Definitely use a mask at least weekly in your opinion? I have some major zittage going on right now! I haven't had this issue for 11 years! ICK!!!! I wonder if this would zap zits?! this is so good and easy and thrifty...I can almost feel the grim coming off my face already..haha. Thanks, I'm loving all your skin care tips! This is so brilliant. Thank you for sharing. Just discovered your wonderful blog, and even managed to find the green clay powder in the tiny organic shop in my neighborhood (I live in Israel). I used it and I have to say - it's the best one I've tried yet! I'm 30 and my skin turned from oily to combined lately (which means my cheeks get dry but T-zone in full of black-heads...). This simple mask, unlike all the mysterious ingredients and perfume packed and sold by the fancy brands, gave me a clean skin and healthy glow! Love it!!! What do u recommend for more dry than oily skin? I plan to try this mask on my nose and chin, but I definitely lean more toward dry skin. you can add a drop or two of tea tree oil. helps with blemishes due to its antibacterial properties. also, instead of water mix it with apple cider vinegar. ACV contains alphahydroxy and is an excellent exfoliant. I do this once a week, it works wonders!! Hi! I stumbled upon your wonderful blog on Pinterest and am now hooked! I am looking to order green clay from Amazon. Do you have a suggestion for the best brand? Will this cause any type of skin purging? Many clays, cause initial breakouts (or in my case tons of tiny bumps that look like a skin reaction). I've read great thinks about how great French green clay is for oil absorbing, but I don't want any breakouts to form. Excellent...I have never heard about this I am very excited to try this because ?I am a working women and my skin is very oily and pimple on my face especially in summers I read your post I like so and this post help me so much thanks for sharing us I am waiting for your next post.